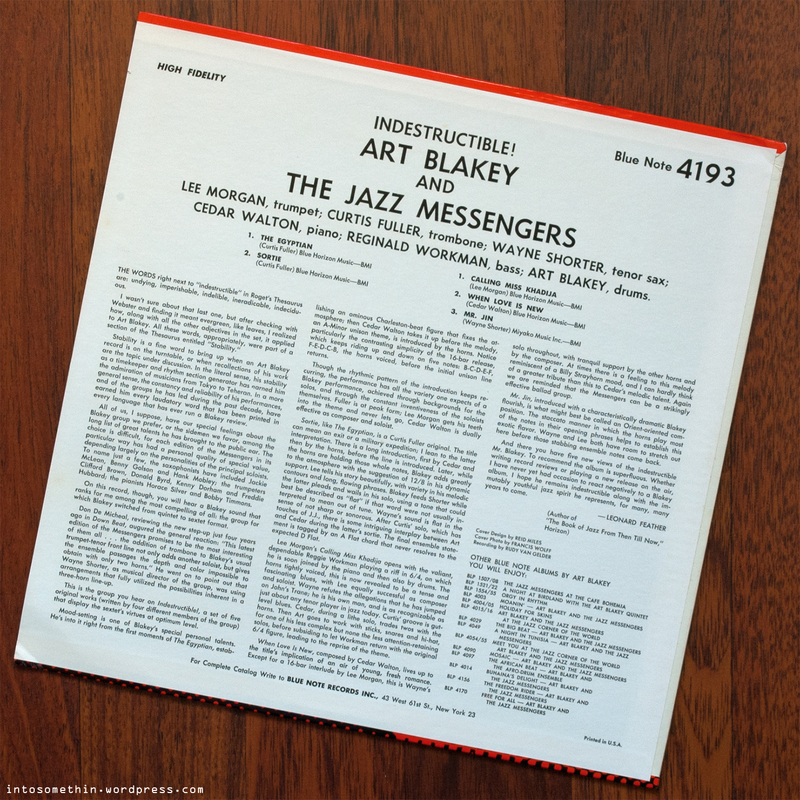 Artist: Art Blakey and The Jazz Messengers. 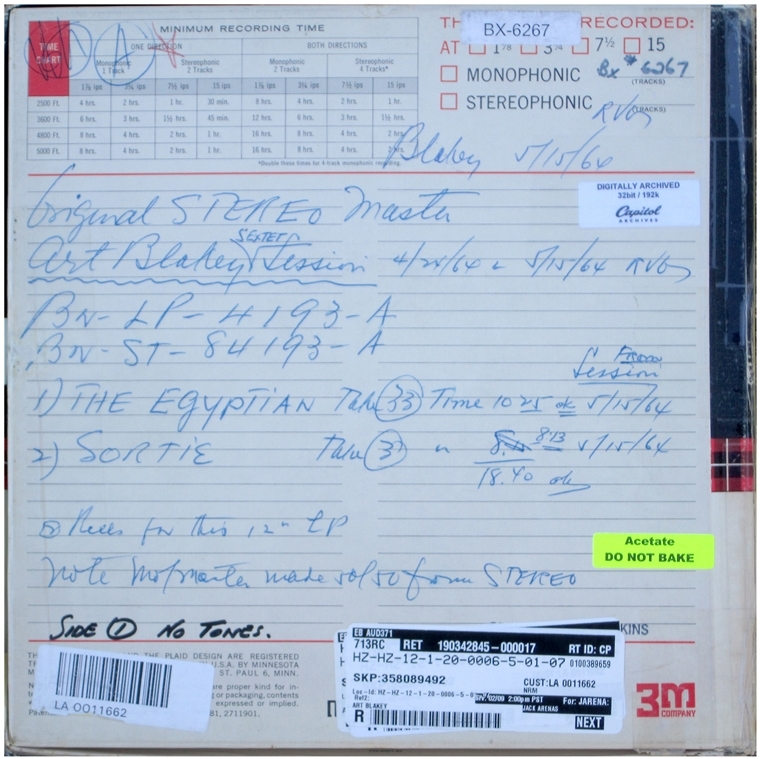 Label and Catalogue Number: Blue Note BLP 4193. Personnel: Curtis Fuller (trombone); Wayne Shorter (tenor sax); Lee Morgan (trumpet); Cedar Walton (piano); Reggie Workman (bass); Art Blakey (drums). Side 1: The Egyptian; Sortie. Side 2: Calling Miss Khadija; When Love Is New; Mr. Jin. Recording Date: 24 April 1964 and 15 May 1964 at the Rudy Van Gelder Studio, Englewood Cliffs, New Jersey, USA. 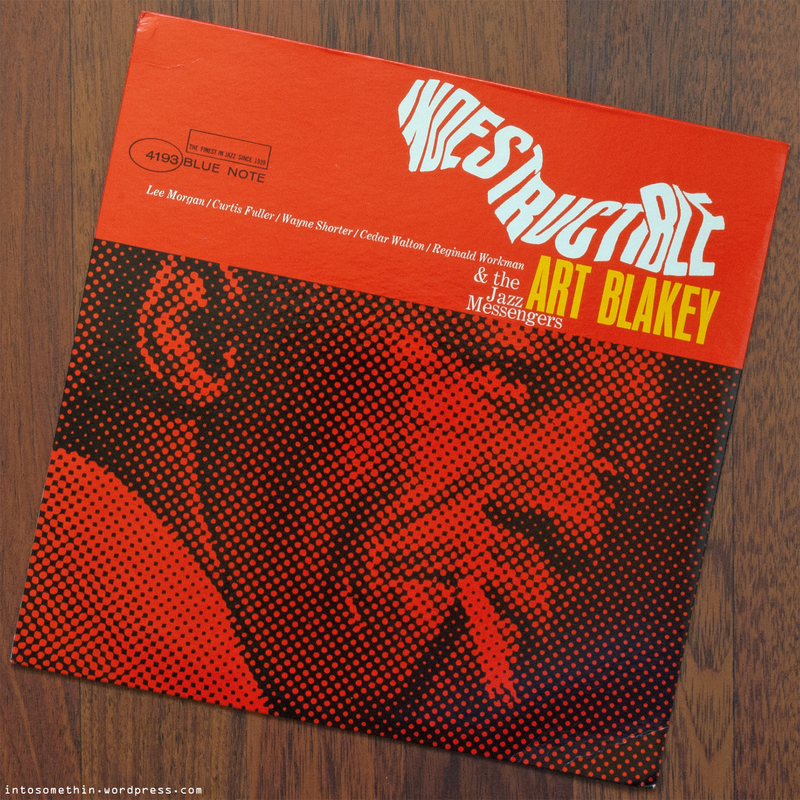 The hardest of hard bop is synonymous with Art Blakey and the Jazz Messengers and both the front cover and the title of Indestructible! leave you in no doubt that the man meant business. 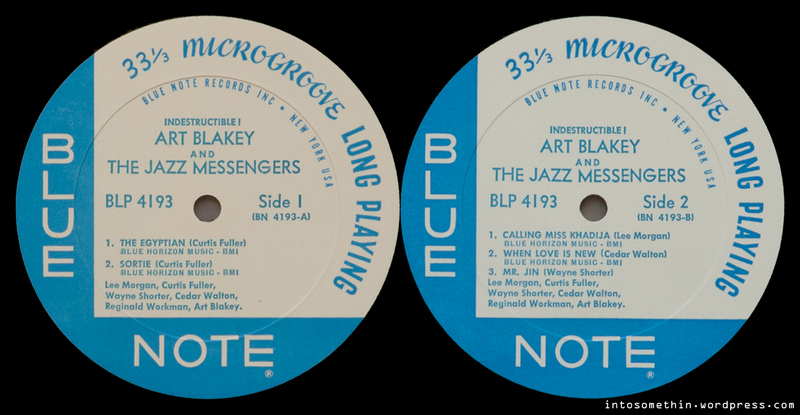 This LP is drawn from the last two sessions the Jazz Messengers set down for Blue Note (although the record itself was not released until two years later and even then was not the final Jazz Messengers LP to be put out on the Blue Note label as new owners Liberty continued to mine the vaults for un-issued material). It also represents perhaps the zenith of the group’s line-ups and recordings – talk about leaving on a high! Given that the make-up of this sextet version of the Jazz Messengers had been stable (apart from Morgan’s return to replace Hubbard) for some time, the quality of this record should come as no surprise. The surprise comes when one looks at the session log which shows that a session on 16 April 1964 produced no takes used on this LP and that the session of 24 April 1964 only contributed When Love is New. It was the third session the following month that saw the band get its act together and successfully commit to tape the remaining four takes used on the record. For completeness, I should note that a take of It’s a Long Way Down from the first session did eventually make it to vinyl on the Japanese release Pisces (Blue Note/King GXF-3060). Many successful Jazz Messengers incarnations have been based on a quintet format but the addition of Fuller on trombone led to a stable and lengthy stint as a sextet between 1961 and 1964. Aside from a quartet of LPs for Blue Note, there was one for Impulse, three for Riverside and an obscure one-off for Colpix that all featured Fuller as part of a sextet. Indestructible! really shows how the trombonist added a new dimension to the standard hard bop/soul jazz groove. Not only did his instrument provide another richer tonal dimension but his writing also made a difference. It’s fitting that the whole of Side 1 is devoted to two of Fuller’s compositions. Both Sortie and The Egyptian are strong tunes that extend the Messengers tradition with interesting new possibilities and I was sorely tempted to choose one or the other of these as the track for the audio selection on this posting. The reason I didn’t is that while I was compiling this, Andy over at London Jazz Collector added a review of the recent Music Matters stereo re-issue of this LP and picked Sortie as his sample while his older posting about his stereo first pressing included a rip of The Egyptian. So, rather than repeat pleasures you can experience elsewhere, I’ve gone for Morgan’s Side 2 opener Calling Miss Khadija to give you a flavour of how this record sounds in its mono guise. This too is a potent performance and typical of Morgan’s mid-1960s style with the added bonus that it gives us a clear opportunity to hear Workman’s bass sound. The rest of side two democratically shares out the compositional cake between Walton’s When Love is New and Shorter’s Mr. Jin. The former is perhaps the gentlest moment on the record and the latter is an example of how Shorter was fast evolving into one of the most inventive composers in jazz – it’s all too clear to see why Miles Davis was so keen to recruit him for his new quintet. Having alluded to the new Music Matters re-issue above, I’m going to take the liberty of borrowing their terrific photograph of the master tape box. I’m sure Ron Rambach won’t mind, especially if I direct you to details of how you can order this high quality package. The sad news is that this is one of the final 13 such Blue Note re-issues that Music Matters will be doing. I don’t know what Ron plans to do next (if anything) but I hope that I’ll be able to find out through our occasional correspondence. By the mid-1960s it was increasingly rare to see liner notes written by Leonard Feather. By the time Indestructible! was released, it was over a decade since Feather’s magnum opus The Encyclopedia of Jazz had been published and he was well established as the most influential writer about jazz. That depth of experience shines through as Feather homes in straight on the significance of this edition of the Jazz Messengers: stability. There’s some brief musing on other favoured editions of the band but then no further time is wasted in getting to the music. The remainder of the notes are devoted to the five tunes and, aside from providing pointers for the listener in each case, Feather wears his musical knowledge lightly. Notice how he describes Blakey’s introduction to The Egyptian as “an ominous Charleston-beat figure that fixes the atmosphere”; how he clues us to the knowledge that Calling Miss Khadija begins with “Workman playing a riff in 6/4”; or how he slips in the information that the end of Sortie “is tagged by an A Flat chord that never resolves to the expected D Flat”. I, like many listeners, won’t understand these terms yet Feather gives us vocabulary to attach to effects we enjoy so that we can come to appreciate them all the more. To close, Feather raises a toast to Blakey’s continued indestructible spirit and wishes him “many, many years to come”. It certainly seemed to work because I recall the Jazz Messengers performing live and as ebulliently as ever in my neck of the woods in the late 1980s. Indestructible! is one of a select few Blue Note mono releases where the first pressing combines the presence of the New York labels with the absence of the Plastylite “P” from the deadwax. This combination of circumstances is typical of Blue Note records where the sessions were taped under the independent ownership of Lion and Wolff but the record was not released until after the sale of the company to Liberty. That sale included transfer of all stock held by Blue Note including unused New York label blanks, so Liberty wasn’t going to let those go to waste! My copy illustrates this well with nice clean New York labels on both Side 1 and Side 2 but without the Plastylite “P” in the deadwax of either side though both sides do have the “VAN GELDER” stamp. The matrix number hand engraved on Side 1 reads “BNLP-4193 A” and “BNLP 4193 B” is inscribed on Side 2 though there’s something illegible crossed out before the “4”. Perhaps Rudy got distracted when he was preparing this one? The record weighs in at 149g and is in definite Near Mint condition. In fact, I’m pretty certain that I’m the first person to have played this particular copy for a reason that I’ll explain below. The cover is in exceptionally clean condition apart from a couple of corner wrinkles, the credit for which goes to the fact that it came to me sealed in shrink wrap complete with a vintage Sam Goody price sticker. There’s always a question over whether to remove the shrink wrap or not and, in general, I do tend to remove it. After all, it’s done its job of protecting the cover and would only start to get tatty over time. This record now lives safely and snugly inside my standard set of preservation measures, so the shrink wrap is obsolete. In this case, I had another reason for wanting to remove it: Fred Cohen’s book states that first mono pressings of Indestructible! should have a laminated cover and the shrink wrap was preventing me from checking that properly. There is a definite sheen to the cover but not the deep gloss you’d see on, for example, the covers of 1500 series records. I’ve compared it with several coated (i.e. definitely not laminated) Blue Note covers of similar vintage and that shows there there is some lamination but I have to conclude that it’s a less luxurious option probably as a cost cutting measure by Liberty. I’d be interested to hear from other owners of Indestructible! on this point. The final piece of circumstantial evidence to place before the jury is that this record came complete with an original 1939-1966 “27 YEARS OF BLUE NOTE” inner sleeve which is consistent with the initial year of release. So I’m going to claim this one as a mono first pressing.